Tuning-in is a call to your higher Self, the healer within, and aligns you with Infinite source. Set an intention for healing your stress and anxiety as you connect with your inner Heart’s Wisdom. Translation: I bow to the infinite teacher within, and open myself to the infinite source of wisdom, healing, and creativity within me. Place your hands at the heart center, and feel the knuckles of the thumbs press into the notch in the breastbone. This is a reflex point for the vagus nerve–allow the vibration of the mantra to penetrate from your hands into your heart. Allow your natural voice to rise from the navel point. Chanting mantras is not singing, it is about finding your authentic voice and allowing it to rise from deep within. Tuning in is a call to your higher Self, meaning that still voice inside that does not stem from your ego. The effects of tuning in are physical as the nervous system calms down and the heart begins to generate a rhythmic coherent sine wave pattern as shown in the upper portion of the graph. 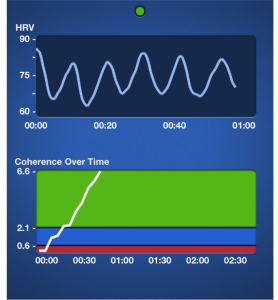 My abrupt coherence shift while “Tuning In” using the HeartMath® inner balance phone app. Lower graph: Red is low coherence, blue-medium, green-high heart coherence. Notice that I began in a low state of heart coherence (red lower bar), and then rapidly transitioned to medium (blue middle bar) and within 30 seconds into a state of high heart coherence (green upper bar). With regular practice the body-mind becomes attuned to the Adi Mantra and “recognizes” that a shift is occurring from ordinary focus towards a neutral mind. This mantra is used for “tuning in” to your heart’s wisdom and self-knowledge that exists within each of us. It opens the body and psyche up for healing through stress reduction. Along with tuning in you may add aromatherapy for creating a meditative space for stress relief.